On Sunday, Germany and Argentina meet in Rio de Janeiro's Maracana stadium for the World Cup final. Thousands of local Brazilians will be in attendance for the match, faced with a tough choice. Do they support Germany, the team responsible for Brazil's humiliating World Cup annihilation, or Argentina, their country's sporting nemesis? We are a nation of 200 million Germans. Away from the stadium, the two South American heavyweights are mostly friendly, with close economic and cultural ties. The height of political tensions, as my colleague Dom Phillips points out, was almost two centuries ago, when "Brazil and an early incarnation of the Argentine state fought a three-year war over territory that later became Uruguay." But now the only thing possibly more nightmarish for many Brazilians than their ignominious exit is the prospect of Argentina lifting that gleaming golden trophy on Brazilian soil -- something the Argentines would surely use to lord over their neighbors for decades to come. Rio de Janeiro's mayor, Eduardo Paes, earlier joked that he would "kill himself" if Argentina beat Brazil in the final. That won't happen, at least, but Argentine glory will still be hard to stomach for many. 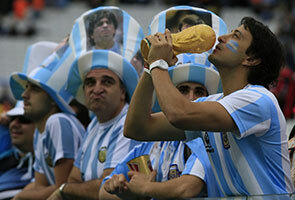 Some 100,000 Argentine fans are expected to descend on Rio this weekend. The unofficial anthem of this World Cup for the Argentines, sung by both massed ranks of fans and the jubilant players of the national team, is a dig at Brazil, asking Brazilians in its first verse how it feels to be bossed in their own home. (The song is a modified version of a chant sung by fans of rival clubs in Buenos Aires.) It goes on to remind Brazilians of an Argentine victory over them in the 1990 World Cup and ends by stating the Argentine position on the soccer world's eternal debate: Who is the greatest player of all time, Diego Maradona (of Argentina) or Brazil's legendary Pele? Maradona, never one to shy from provocative remarks, routinely feuds with Pele and once claimed "nothing is as beautiful as beating Brazil." Argentine fans are hoping their new Maradona, Lionel Messi, will cement his place in the global imagination with a victory in the Maracana. Brazil, though, still has imperious soccer history and Pele's three World Cup trophies on its side. Fans throughout the rest of Latin America will likely back Argentina out of geographic and cultural solidarity — a European team has never won the World Cup on this side of the Atlantic. But, as polls show, they do so grudgingly: Argentines have a regional reputation for arrogance and European pretension, a legacy of mass European immigration in the early 20th century at a time when Argentina's economy was one of the world's most robust and dynamic. There have been a few reports of Argentine fans in Brazil engaging in racist behavior. The specter of racism often shadows the heated clashes between Brazilian and Argentine club sides, which even without that sort of animosity frequently boil over into violence. But such tensions obscure a more immediate reality of camaraderie and collaboration. Plenty of Brazilians, a minority to be sure, will support their neighbors. As Argentina's economy tanked and Brazil's surged, dozens of Argentine players opted to ply their trade in Brazil's soccer league. The superstars on both sides are teammates in Europe's biggest clubs. Neymar, Brazil's injured talismanic striker, plays alongside Argentina's Messi for FC Barcelona in Spain. Unlike many of his compatriots, he'll be backing his pal on Sunday. "I'll be cheering for him," said Neymar.